"In the great Gaudiya Vaisnava teachers' line, as Srila Bhaktisiddhanta Saraswati he's renowned. Like the radiant sun in the morning sky, he appeared to rescue all souls swallowed by the all-devouring impersonal philosophy. By spreading the teachings of Lord Gauranga to sing the Holy Name of Lord Sri Krsna, he gave all the chance to dive in the ocean of love of Sri Krsna, the Supreme Person. Srila Bhaktisiddhanta, my lord, divine master—at his feet do I pray to serve him forever." We are presenting here the first part of the biographical compilation dedicated to Bhagavan Sri Srila Bhakti Siddhanta Saraswati Thakur Prabhupad taken from a lecture of Om Vishnupad Jagad Guru Srila Bhakti Sundar Govinda Dev-Goswami Maharaj. The page shall be updated and expanded in the course of time. Today is our Param Gurudev Sri Srila Bhakti Siddhanta Saraswati Goswami Prabhupad's auspicious Vyasa Puja, or appearance, day. "Vyasa" means one who expounds the Vedas and in this sense it means Sri Krishna Dvapayana Vedavyas—we call his appearance day 'Vyasa avirbhav tithi.' He divided the Vedas into four parts; he expanded the Vedas widely, compiling eighteen puranas, the fifth Veda Mahabharata, Vedanta Darshan, and many other different kinds of scriptures; he preached all over the world—that is why his appearance day is called Vyasa Puja day. Vyasadev is also the Adi-Guru (the original guru). Generally, Brahma is known as the Adi-Guru, but after Brahma this place is taken by Vyasadev. Brahma possesses special powers, he worships the Lord, initiates great souls, but in this present world all this is spread by Vedavyas, that is why we honour the appearance day of Vyasadev as the Vyasa Puja day. Those who, like Vedavyas, travel throughout the world and preach are also called Vyasa. Such Visva-gurus are honoured in various ways and the souls who possess sufficient faith and sukriti worship them on their appearance, or Vyasa Puja, day. Srila Saraswati Thakur appeared many years after Mahaprabhu. When Nityananda Prabhu arranged Mahaprabhu's Vyasa Puja celebration and put a garland on Mahaprabhu's neck, everybody saw They were non-different. 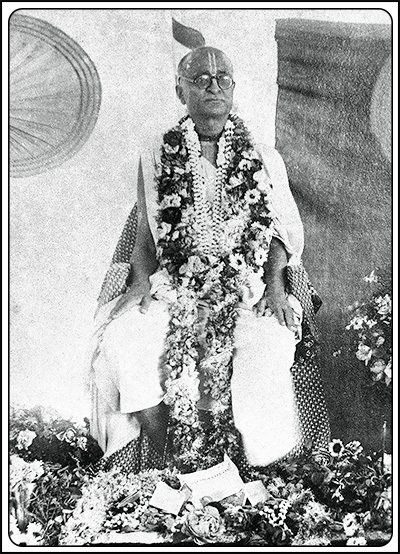 After Mahaprabhu, many acharyas came in this world and preached about the Lord within our sampradaya (Srila Narottam Das Thakur, Srila Vishvanath Chakravarti Thakur and many others), but their preaching was not as extensive—Srila Bhakti Siddhanta Saraswati Thakur preached about and glorified Mahaprabhu very widely and exclusively; that is why everybody worships him as Vedavyas and his appearance day as Vyasa Puja day. Also, in general, all gurus are considered an incarnation of Vyasadev, and everybody can worship the appearance day of their Gurudev as Vyasadev's appearance day, but Srila Bhakti Siddhanta Saraswati Thakur' appearance day (or Vyasa Puja) is celebrated by all Gaudiya Maths and associated missions in an exclusive way here in India and all over the world too. Our Guru Maharaj (Srila B.R. Sridhar Dev-Goswami Maharaj) too worshipped the appearance day of Srila Bhakti Siddhanta Saraswati Thakur as Vyasa Puja day and taught us to do it properly. Wherever we see there appeared a great acharya who preaches the teachings of Sri Chaitanya Mahaprabhu very widely, we must say that the power of Vyasadev is present there otherwise it is not possible. For example, you have heard also that sometimes Srila Guru Maharaj would say that Srila Swami Maharaj is a saktya-vesa avatar, that the power of Nityananda Prabhu as well as Vedavyas is working through him in this mundane world. "At a time when religion was evaluated in terms of bodily relationship, saintliness was determined by ignorance, and yoga practice was motivated by sensual pleasure; when scholarship was cultivated just for voidism, japa was conducted for the sake of fame, and penance was performed out of vindictiveness; when charity was given out of pride, and on the pretext of spontaneous devotion the most gross, sinful acts were perpetrated, and in all such anomalous situations even the intelligentsia were at loggerheads with one another—at that very time, you were sent by the Almighty Creator." "By its intrinsic nature, the soul is an eternal servant of Krishna; the souls comes from the marginal energy of Krishna and are simultaneously one with and different from the Lord. Having forgotten Krishna, the soul wanders throughout the universe. Being thus covered by illusion, the soul goes through much material suffering." Sometimes the question comes why we do not join the Vishva Hindu Parisad and other similar societies. We support what they do (we support whatever goodness there is in their activities), but we are not with them directly because we do not think that we are brahmans, Hindu, Muslim, or Christian. Our actual potency is the jiva soul and the jiva soul is separate from the mundane things—every jiva soul possesses a transcendental form, and with their willing, feeling and thinking they must try to engage themselves in the service of Krishna. All scriptures also try to take everybody from the mundane plane to the transcendental plane, which is direct service to Krishna under guidance of His close associates. This is the only duty of all jiva souls. The soul forgot service to Krishna and has become bound in this mundane environment—it needs help to come out of this mundane world, and it needs engagement in service to Krishna. That is why we do not identify ourselves with Hindu, Muslim, Christian, etc. The way we look at it is that you may think, "I am Japanese," or "I am American," or "I am English," but when you die you may be born in another country, so "American," "English," "Indian," "Hindu," "Christian," etc. is not your proper identity. Our actual identity is that we are servitors of Krishna. We forgot Krishna and have come here with our bad intention—that is why we have become bound by maya (illusion), and now we need help of the devotees of Krishna to get out of it and establish ourselves in our true identity, get true liberation (muktir hitvanyatha rupam svarupena vyavasthitih—real liberation is service to Krishna). This is what we practise, and that is why we do not want to join any other societies. "I am not a brahmana, I am not a ksatriya, I am not a vaisya or a sudra. Nor am I a brahmacari, a householder, a vanaprastha or a sannyasi. I identify Myself only as the servant of the servant of the servant of the lotus feet of Lord Sri Krishna, the maintainer of the gopis. He is like an ocean of nectar, and He is the cause of universal transcendental bliss. He is always existing with brilliance." This is our only identity, nothing else. This is the main general teaching of Srila Bhakti Siddhanta Saraswati Thakur in this mundane world, and also supremely and exclusively he also taught Radha-dasyam (servitude in the line of Srimati Radharani). Srila Bhakti Siddhanta Saraswati Thakur Prabhupad appeared in Jagannath Puri Dham as a son of Srila Bhakti Vinod Thakur, a parasad of Sri Chaitanya Mahaprabhu. At that time, Srila Bhakti Vinod Thakur was Deputy Magistrate, and the government of Puri gave him a house near the Jagannath temple (in this way, Srila Bhakti Vinod Thakur was also the managing administrator of the Jagannath temple). Later, by our Guru Maharaj and Srila Madhav Maharaj's mercy there was established a temple of our sampradaya at that place. When Srila Bhakti Siddhanta Saraswati Thakur appeared, he was born with the umbilical cord around his neck like a brahman thread. Everybody was surprised to see the child being born like that. It was like an omen that in future he would clean the sampradaya... About six months later there was Ratha-yatra festival. When Jagannath's chariot was going down the road, it suddenly stopped at the door of Bhakti Vinod Thakur's house and did not move from there for several days. Every day Srila Bhakti Vinod Thakur would come out with his child to take the darshan of Jagannath—Jagannath was very happy to see the child and the child was also very happy to see Lord Jaganath. After a few days, the chariot moved again. "If you do not want to go to the life of a grihastha, what will you do then?" "I want to dedicate my life to the exclusive service to Mahaprabhu. This is my life's goal," answered Srila Saraswati Thakur. "Then you must take the charge of Mayapur." "It is very high and hard service, but I have a renounced mentality and I will not be able to maintain this Mayapur seva properly. There are too many hazy elements and disturbance there, I cannot tolerate that." "If you cannot tolerate some disturbance for Mahaprabhu, then what will you do? For Mahaprabhu you must tolerate everything, and you cannot tolerate some small disturbance! This world is not Vaishnavs' world, it is actually a mayavadi place, but I think you are not a mayavadi, are you?" "No, I am not a mayavadi, that is for sure. But this service is very hard for me..."
Then Bhakti Vinod Thakur assured him, "Do not worry, Mahaprabhu will help you." In the end, we see that Prabhupad took charge of Mayapur, Yogapith, and chaitanya Math and other services there. From his childhood pastimes, Srila Saraswati Thakur showed that he had a very renounced and firmly established in the spiritual conclusions (bhakti-siddhanta) nature. He was expert in both. He was also an expert in all sastras, including the jyotish sastra (astrology). Guru Maharaj wrote also, "Suvicharaka iva jivaka iti sadhubhiruditam"—Srila Prabhupad's character was such that everybody said he was an incarnation of Srila Jiva Goswami in this world. The glories of his preaching were like the glories of Srila Narottam Das Thakur's preaching manifest in this world. He preached the teachings of Rupa-Raghunath all over the world, in a pure way. Before Prabhupad's appearance the state of the world was very lamentable—just within some four hundred years after Mahaprabhu's appearance there was no trace of it left in the world, and Srila Saraswati Thakur revived it extensively and exclusively.